Beyonce: Is this proof that singer is a mom again? As speculations that Beyonce has been delivered of her twin babies, continue to rise, a curious package arriving at a certain Los Angeles hospital only fuels those flames. An unidentified woman was pictured on Friday, June 18, arriving at the Los Angeles hospital where the singer is believed to have put to bed. 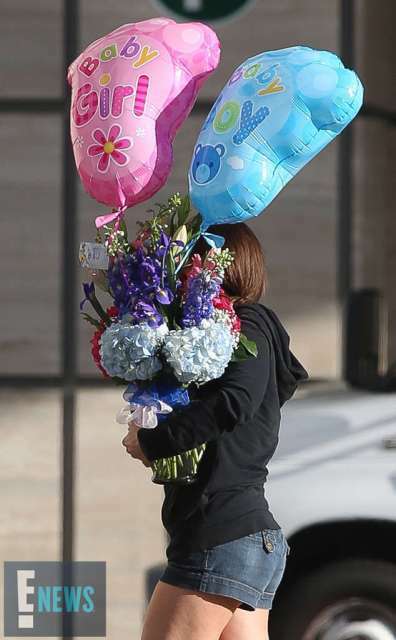 The woman is seen carrying a bouquet of pink, purple and blue flowers with two giant baby foot-shaped pink and blue balloons that read, "Baby Girl" and "Baby Boy." E Online reports that according to an eyewitness account, the woman walked into the front of the building, then got back into her car and drive into an underground parking lot. A few minutes later, she reemerged without the bouquet. Are you thinking what we are thinking?